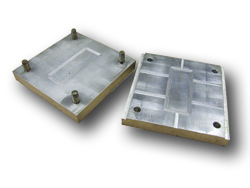 Transfer moulding produces very high quality rubber components suitable for precision components. The mould is heated to a temperature exceeding that of the thermoset rubber compound which itself is heated to a fluid state and forced through a series of sprues and runners. Once formed the rubber is allowed to cool and then removed from the mould. Examples of transfer moulding include our cylindrical bushes, cone mountings, hexagonal bobbins, and sandwich mountings.